Recently, I received from the Rocky Mountain Redline press fleet a Toyota Sienna minivan to test. 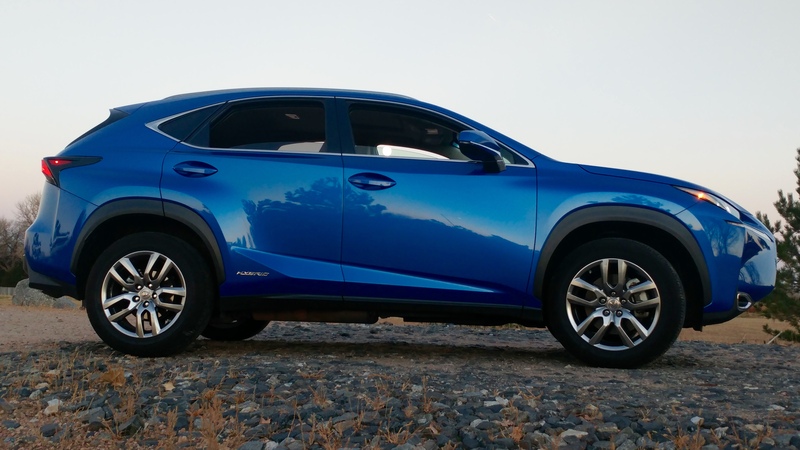 It was an all-wheel drive model, unlike a earlier front-wheel drive tester that I analyzed. It also arrived at a more pleasant time of year, a nice fall spell, as the red model was here during a particularly frigid spell in January. As you can see from the photo, my 2016 test van was around here for some very nice weather. My Sienna was the Limited Premium model with several upgrades such as backup camera, audio/navigation with 7″ screen, SiriusXM radio, Bluetooth connectivity, Toyota’s Entune Audio Plus app suite, brown leather seating for seven, 2nd-row lounge-seat captains chairs, stowable third row seat, cruise control, tilt/telescope, Smart Key system with pushbutton starter, triple 12v power outlets, overhead DVD entertainment system, blind spot monitor, parking assist sonar, rear cross traffic alert, and ten cup holders. 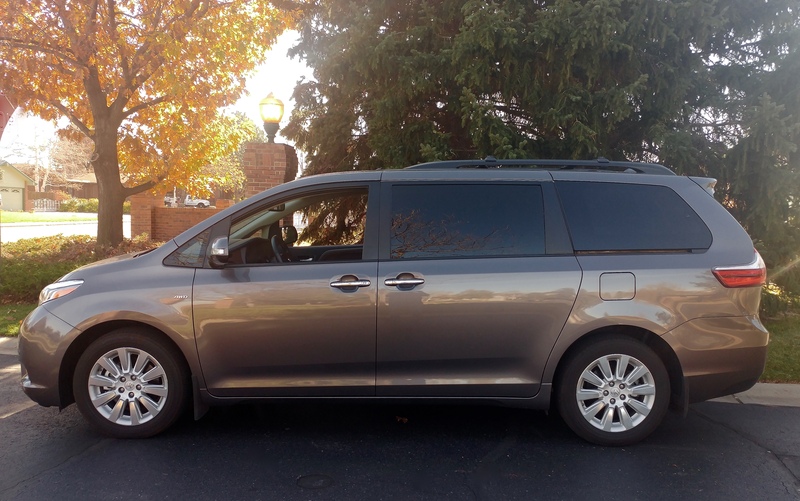 Toyota’s Sienna Limited comes in five different colors and the one I drove was painted Predawn Gray Mica metallic. Of course the vehicle was equipped with power sliding side doors (they have roll-down windows), dual moon roof openings, and a power rear lift gate. The length of the Sienna was 200.2″ set on a 119.3″ wheelbase; weight was 4,705 lbs. Getting in and out of the minivan is easier than a sedan and near a crossover SUV level of convenience. Visibility is great, as is ride and guidance on the road. Handling is excellent for a minivan. Minivan styling is not an attraction to such a vehicle, although I personally like the looks of all of them. This Sienna had attractive ten-spoke machine-finished 18″ alloy wheels with P235/55R18 Bridgestone Turanza EL400 steel-belted all-season radials. Luggage rail cross bars were up top, chrome door handles were present, and round fog- and backup-lights dressed up the fascia, front and rear. Power for the all-wheel drive Toyota minivan is produced by a 3.5 liter V-6 with 266 horsepower (@ 6,200 rpm) and 245 lb. ft. of torque (@ 4,700 rpm). A six-speed automatic is coupled to it with the shift tower mounted on the dashboard to the right of the steering wheel. 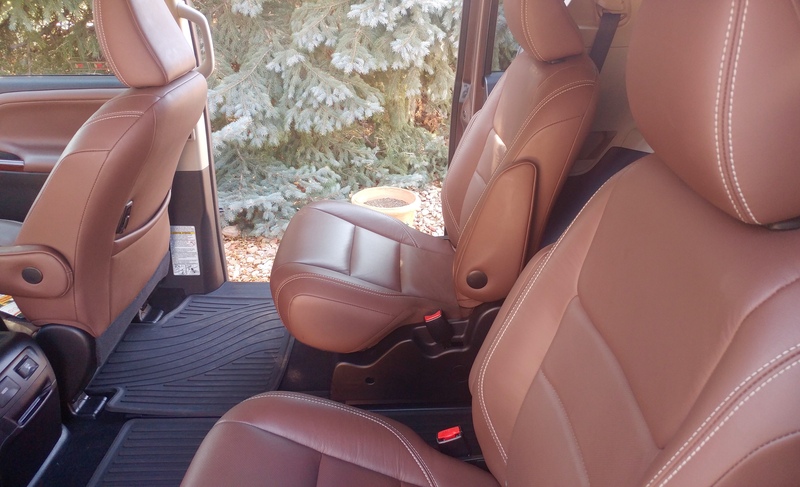 Thus, the driver (or front passenger) can slide over to the other armrest-equipped bucket seat, if desired. Fuel economy for the Sienna is 16 mpg in the city and 23 mpg on the highway. The combined rating is 19 mpg. 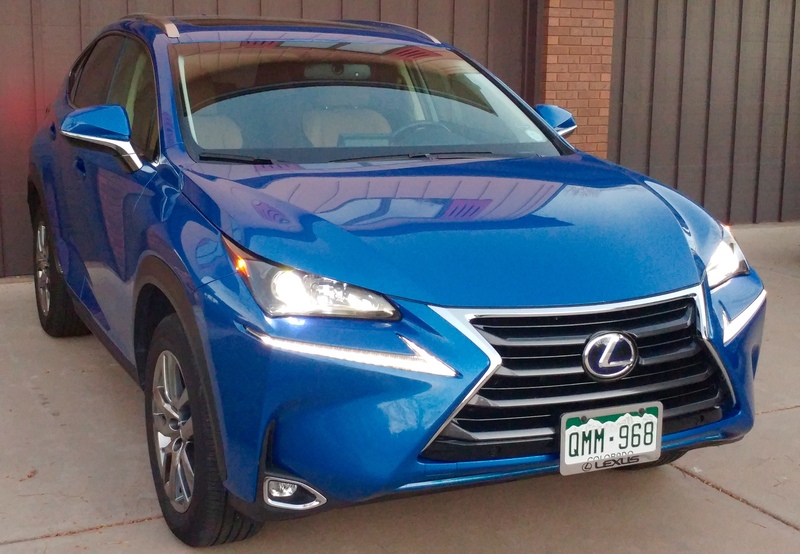 I found the performance of my test Toyota to be suitable, and the company also offers an front-wheel drive setup on the Sienna, which is what I drove early this year. M.S.R.P. for the van carried an M.S.R.P. of $49,446.00; I enjoyed testing the Sienna and it seems to me to represent a good value in its segment. 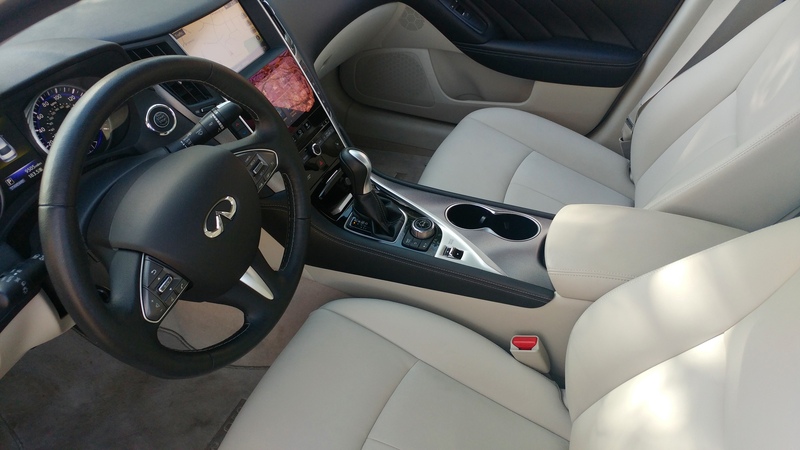 As noted during my conversation with George, the Q50 was incredibly nimble and the white interior was stunning. 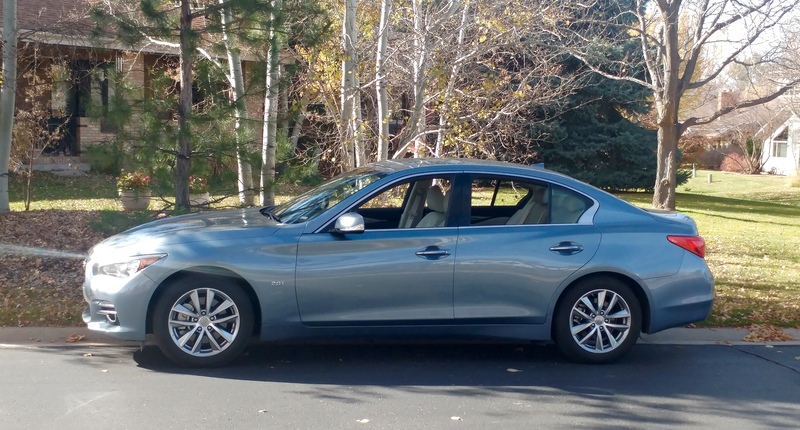 My past tests of these Infiniti sedans always involved a V-6, and I have to say I endorse their decision to install a 208 horsepower turbo – 4 in this 2016 model.